Sherry and I were driving to Twee Riveren when we saw a cat in the river walking toward us. To our surprise it was a leopard. This was the first good leopard sighting we've had in the park and it was about 1 in the afternoon. He/she has one of the prettiest necklaces we'd ever seen. 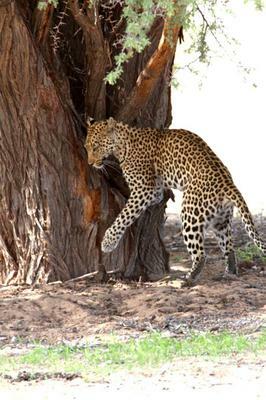 This was the first of two Leopards that we were able to photograph this trip. 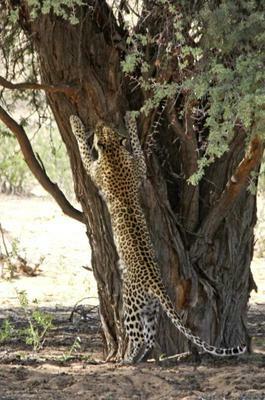 In this series of photos the animal spent a lot of time climbing, marking and laying in the shade of a large tree. I love these cats too and they are not often seen. You have more chance of seeing cheetah than leopard. Great sighting guys. Great sighting and pics Bob! 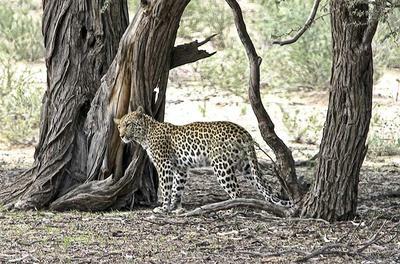 Leopards are not easy to find in the Kgalagadi so well done on getting this one! I wonder which leopard this is? There is a Kgalagadi leopard ID booklet that lists all the known leopards in the park - I forget what it's called - would be interesting to know.